The music scene in India is gradually taking a higher seat with several music concerts and festivals organized all around the country. Be it any form of music, classical, Sufi or even EDM, the different states of India represent best of every kind throughout the year. If you are a music lover and want to escape into some revitalizing musical concert or festival in India, the next upcoming beat is to be heard at Kasauli Rhythm and Blues Festival. It is no less than a mecca of music lovers who want to listen to diverse music by upcoming singers and well-established talents across the country. 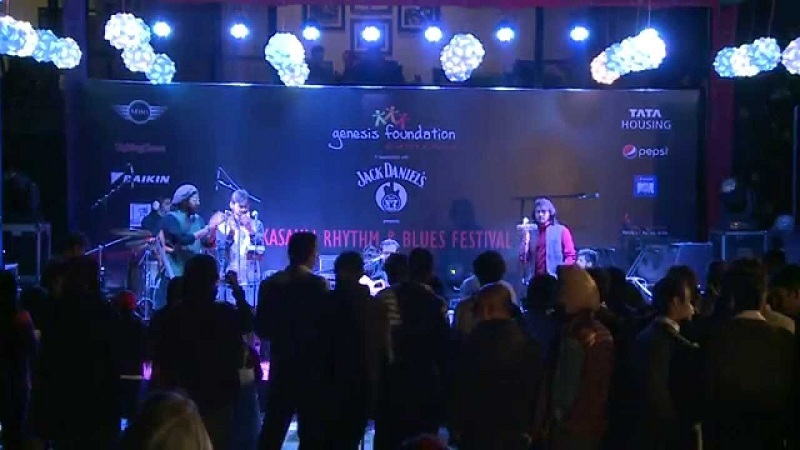 Kasauli Rhythm and Blues is an establishment by Genesis Foundation, running in its eighth year. This small hill station in Himachal Pradesh has turned into a musical hub for enthusiasts both national and international level. This annual music festival has recorded some of the most mesmerizing live performances by artists like Usha Uthup, Lesle Lewis, Shilpa Rao, Sonam Kalra, Rabbi Shergil and Kulte Khan Sufi Collective. As aforesaid, Kasauli Rhythm and Blues is in its eighth edition this year and like every year, it is going to be a grand music festival in Solan, Himachal Pradesh. Read on for some important information about the event along with the dates and venue. Conceived by the Genesis Foundation in the year 2012, Kasauli Rhythm and Blues in Solan, Himachal Pradesh was a positive initiative to grow their community of well-wishers and donors. Held annually in the month of March or April, the total funds raised at the event are donated as support for the medical treatment of underprivileged kids suffering with cardiac disorders and critically ill children. The children are from families having a monthly income of INR 10,000 or less. The music artists perform for this special cause and celebrate the gathering of music lovers in large numbers. The thought provoking and fresh lyrics of Subhangi Joshi Collective, a contemporary Indie Pop group will steer your nerves. You will enjoy the collaboration of the duo Kartik Shahi and Nirali Kartik –Maatibaani, this is what happens when contemporary meets folk. Coming from the land of Punjab, Sukhmani and Hari will bring together contemporary and eclecticism, a take on the traditional folk music of the state (Punjab). Catch the 27 year old rock band, Parikrama which is basically involved in Classic Rock with a fusion of Indian instruments like violin and Tabla. Another rock band, Thaikkudam Bridge merges classical and folk sounds of India with layers of pop, ambient, electronic and progressive textures. The best way to reach Baikunth Resort is from New Delhi. Book cheap flight tickets to Delhi from any part of the country and embark on your journey to the venue. The resort is located at a distance of 298 kilometers from New Delhi. Hire a private car and drive towards Ambala on National Highway 1. From Ambala, take NH 22 towards Dharampur. When you are around 2 kilometers from Dharampur, take the left towards Kasauli road. Continue for the next 10kms until you reach Garkhal. Take right to Jagjit Nagar Road. Keep driving for around 3 kilometers to reach Baikunth Resort. The trip to the venue is in itself a wonderful experience, especially when you are in a group of like-minded people. We are sure you are going to have a gala time at the music festival. It’s a soulful retreat for all the music lovers and what could be better than investing for such a good cause! Book your passes right away! Stroll through Pari Mahal in Srinagar: The Splendid Seven-terraced Mughal Garden on Top of a Hill! 7 Brilliant Ways to Enjoy the Ultimate Zen Vacation This Summer! Here’s How Diwali is Celebrated All Around the World!